This is just a quick note to let you know that the results of a data project I’ve been working on for the past few months (can you tell how much I’ve missed doing research?) are now up at Lady Business. 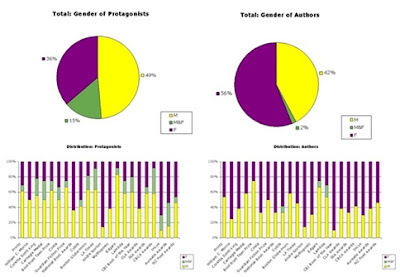 It’s an analysis of the gender balance in the winners of 22 major YA awards since 2000; there’s a full explanation of the project’s ethos and methodology, as well as of the reasons why I think this information is significant, in the write-up I’ve just linked to. As you can probably tell by the sneak peek above, the results paint a picture that might be surprising if we take the conventional wisdom about the current gender ratio in YA into account. One of the key things about these results is the fact that they raise two possibilities: the first is that the gender balance in award winners is proportional to the gender balance in YA at large, in which case we should perhaps pause and consider the cultural biases that make us see female dominance where none exists; the second is that the gender balance in award winners is completely out of synch with the rest of YA, and in that case we’re left with questions about why we’re rewarding stories by and about men so disproportionately. It probably goes without saying that I wouldn’t have invested so many hours in this project if I didn’t believe it was important. And if you believe in your work, you have to do the best you can to get it noticed. Unfortunately, as I’ve explained a few times before, I still struggle with the whole “draw attention to stuff you’ve done” thing, even though I believe this is a crucial skill to have and have been doing my best to acquire it. All this to say that my reach as a blogger is limited, so if you believe this information is important too I’d really appreciate a hand in getting it out there. And of course, I’d absolutely love to hear your thoughts on these results, the questions they pose, the extent to which they do (or don’t) challenge pervasive assumptions about the gender ratio in YA, etc. This is amazing and wonderful work. And yes yes yes re the tenacity of anecdotal evidence even in the face of evidence to the contrary! But I'm not sure I'm getting why you thought the Prinz should be tabulated separately? Jill, the Printz *winners* were not tabulated separately, only the Printz Honor list was. The reason was that I didn't include short lists or lists of finalists for the other awards, so I didn't feel I could include the Printz Honor List in the totals of winners. It would be like comparing apples and oranges, you know? It would be really interesting to expand the count to the short lists/honor lists of the other awards, though. Gosh there's a lot to digest here. The gender difference/gap for some of the awards is astounding. I have the post open for reading, but I thought I'd share my surprise here - I'd have thought those charts would swing far more in women's favour (though an equal balance is, well, good). I'm interested thus in how the awards are decided. Beth F: The Edgar in particular is pretty mind-boggling, isn't it? There are so many women writing mysteries - I see no reason for such a disparity other than the good ol' tendency to take men's writing more seriously. Charlie: You're definitely not alone - I think a lot of people expected that. Excellent article, Ana. Have tweet-pimped it like mad. (delighted to see the CBI award included, btw,:D ) . Awesome, awesome job! Even though I'm not teaching high school any more and don't read a ton of YA, I still really enjoyed reading your findings. I love the point about a slight majority of women being seen as OMG GENDER IMBALANCE, while is men were slightly leading that would been something to applaud in gender parity. Again, man = default. This was great work, Ana. Very very needed. Thank you for doing it! This is seriously thoughtful work, and I'm grateful for it. My favorite part: "There's nothing natural or inevitable about a boy's refusal to have anything to do with the feminine, and validating the idea that this is only to be expected is not only unhelpful but actively harmful." YES! 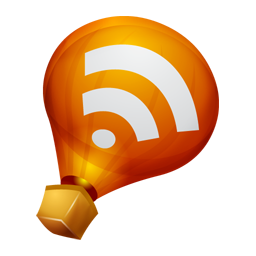 I've tweeted and may link in a blog post later. Whoa! You have been BUSY! :) I hope you're submitting your research to journals, because this needs to be published and you need to get a Ph.D place. Seriously impressive work, Ana. You know you are made of pure awesomeness, don't you? Well, no, you don't know it. But you most definitely are!!!! Celine: Thank you so much - the tweet-pimping is much appreciated :D I really hope putting this information out there will be useful. MJ: Thank you! A couple of people told me about a study that shows that it only takes a group being more than one third women for people to perceive it as overwhelmingly female. Pretty eye-opening findings! Tasha: I'm so glad people have found it useful! Sara: Thank you so much for spreading the word! Violet: You know, I hadn't thought of that. It's usually difficult to get things published without any sort of institutional affiliation, but it wouldn't hurt to see if there's any interest, right? Alex, thank you! The results do raise lots of questions, and being able to ask them in the first place is the first step towards real equality, I think.